Beautiful cows with delicious milk is the simple key to Jersey Dairy’s incredible success over the years. In fact since 1763 – that’s over 250 years of breed protection, product development and now international fame. Walking the beautiful Green Country Lanes of Jersey, one will inevitably come face to face with the most gentle looking of cows, with huge brown eyes and a golden light brown coat. They graze peacefully in the lush island fields amongst daffodils and buttercups, totally free-range, and are lovingly looked after by proud local farmers. No wonder they produce a milk sought after in countries as far away as Asia. 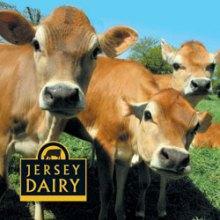 Jersey Dairy also produces some high quality cheeses and, of course, creams, from double to fraiche, the most delicious butter, and a variety of yoghurts. As the product line gets bigger, so does the order book. In 2013, the exciting news for Jersey Dairy – on top of celebrating its 250th birthday – was the exporting of its products to China for the first time. Probably the best way to appreciate Jersey ice creams is outdoors: select your vendor, your flavour, a bench with a view, and enjoy! Jersey cows are now the 2nd most popular dairy cows in the world, with many farmers around the UK and America keen to market a milk 20% richer in calcium and 18% higher in protein, giving it an ultimate luxurious quality. The beauty of the product and of the cows have led to many artistic representations, one of the latest being a series of stamps by local artist Kathy Rondel. But it is Nick Romeril’s artwork that is most associated with Jersey Dairy. His unusual, almost black & white painting of the big brown eyes and horizontal ears is quite spectacular, up on a huge billboard at the site’s entrance and on all of the ice cream packaging. A brilliant union of local talents. This entry was posted in My Jersey and tagged Jersey Cows, Jersey Dairy. Bookmark the permalink.